Initially, I was a little wary of this week’s French Fridays with Dorie recipe. The weather lately had been typical late summer weather, hot and sunny and a little humid, and we’ve been eating mostly salads and fresh vegetables and grilled stuff. Creamy, cheesy, garlicky rice with spinach, while it sounded good, just didn’t match the weather. Then, on Tuesday, a bout of raw heavy rain set in for three days. Suddenly, this hearty risotto-like dish was the perfect thing. Funny how that happens sometimes. In her book, Dorie describes this rice dish as similar to risotto, though not exactly, but delicious in its own right, just not risotto. This put some preconceptions in my mind. An initial scan of the recipe left me with the impression it was a bit involved. I was in for some pleasant surprises. First step was to cook the rice. I’ve only used Arborio rice in risotto or paella, both of which involve lots of time stirring. I’ve never “just cooked it”. I was initially skeptical about the liquid to rice ratio. It was over 3:1, much higher than what I use when cooking long-grain rice. I stirred the rice into boiling chicken broth and let it simmer. Dorie didn’t specify how long it would take, so I set the timer for 20 minutes, the usual for long-grain white rice, and waited to see what happened. In the meantime, I cooked the spinach. I bought a bag of baby spinach because it wouldn’t need stemming, just washing. The bag was large, about 12 ounces, slightly more than the called for 10, but I just used it all because I knew the spinach would shrink down. I cooked the spinach in my largest pot which was full to start. After about 5 minutes, the spinach barely covered the bottom with a thin layer. Amazes me every single time I cook greens. I squeezed out the liquid and gave it a chop. Then, I sautéed some onion and garlic in butter until tender. At this point, it was time to check the rice. The rice had absorbed quite a bit of the chicken broth, but it seemed like there was still a lot in the bottom of the pot. I set the timer for 5 more minutes and grated the Gruyere cheese. Much to my surprise, those 5 minutes were all it took. Rice was tender and the broth completely absorbed. 25 minutes in total to cook the rice. Turns out that I was almost done. 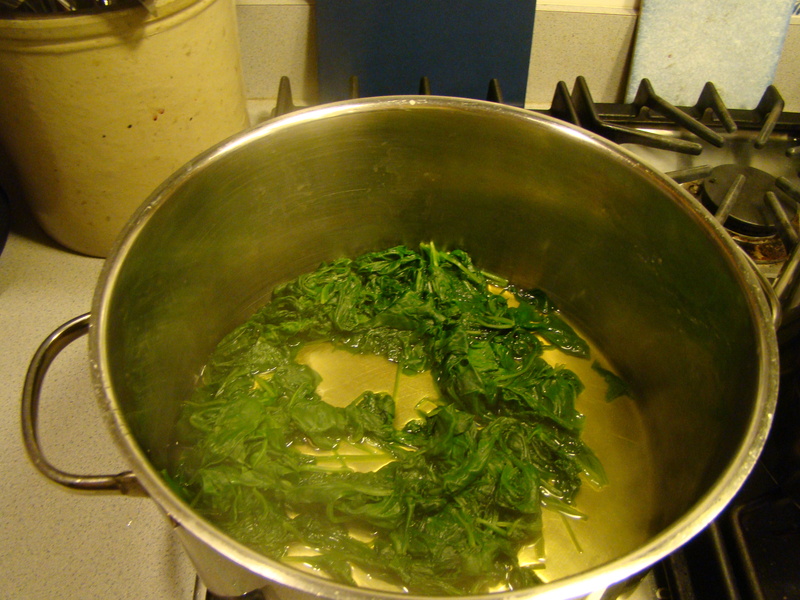 I stirred the moist rice and my handful of chopped spinach into the pot to combine. Then I added some cream and grated cheese and salt and pepper. I gave it a good stir to mix it all up. Voila! Only 40 minutes from time I put the chicken broth on to boil. Not bad for a weeknight meal. I served this alongside some grilled fish, though it could easily have been a meal by itself. 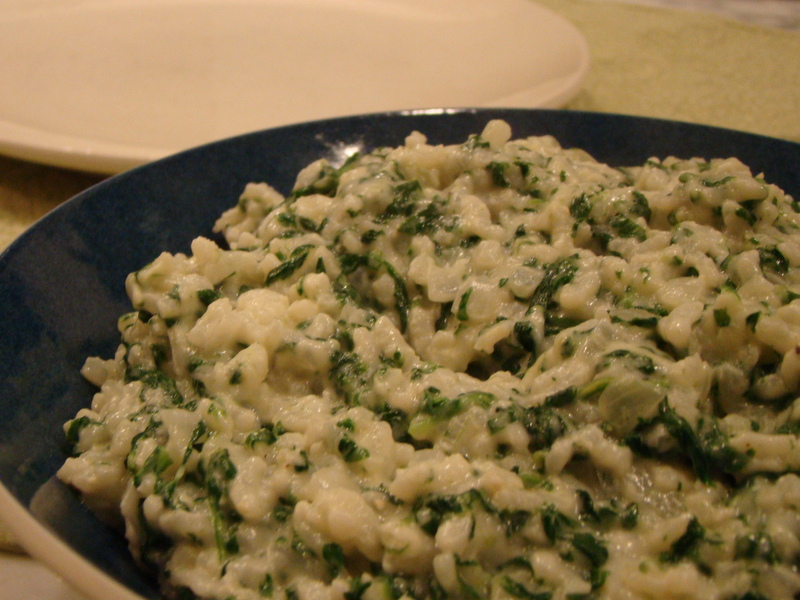 Perfectly named, creamy, cheesy, garlicky rice with spinach was another September winner! I followed this one exactly this time, but there are always some clever variations from the other Doristas. You can check out their versions of this recipe at French Fridays with Dorie. If you’re interested in the recipe, you’ll have to buy the book, Dorie Greenspan’s Around My French Table. But then, you can cook along every week, or as often as you like! Special note: It turns out that according to WordPress, this is the 200th post on A Plateful of Happiness. Seems like a noteworthy number. I’ve been doing this for not quite two years now, and 4 of those posts were guest posts by various family and friends, but still, that’s a lot of writing, and cooking, for someone who spends her days in front of a computer writing code. Posted on 9 September 2011, in Farmers Market, French Fridays with Dorie and tagged French Fridays with Dorie, rice, spinach. Bookmark the permalink. 33 Comments. Wow! 200 posts! That’s an amazing achievement. I was pretty impressed with the little effort required for the great outcome! And can totally relate to the difficulties with planning, but somehow everything that needs to be done gets done!! How awesome for you! I love that WordPress leaves little virtual *high fives* at the end of your posts… one of my last ones was “Cowabunga!” LOL!!! Glad you liked this one too! I think it would be a totally easy meal for a dinner party! Betsy, congrats on 200 posts! I hope I’m as consistent two years from now. Congrats on 200 posts! Loved reading about your experience with the risotto. I was also surprised at how quick this dish went! Happy French Friday! Congrats on your 200th post! That really is something of an achievement isn’t it? Congrats on your 200th post! I have to agree that this dish didn’t quite match summer weather. I’m in TX, so we haven’t seen rain in months. Glad the rain cooperated for you! Congratulations! 200 posts is quite a milestone. I enjoyed your post and I had to laugh because I too am consistently surprised by how little spinach I am left with once it is cooked down. It seems like no matter how much I buy it is invariably only enough for two portions. You would think I would learn. Great dish and congrats on your 200th post! Wow! 200 posts is amazing…I’m still working towards my 50th post! 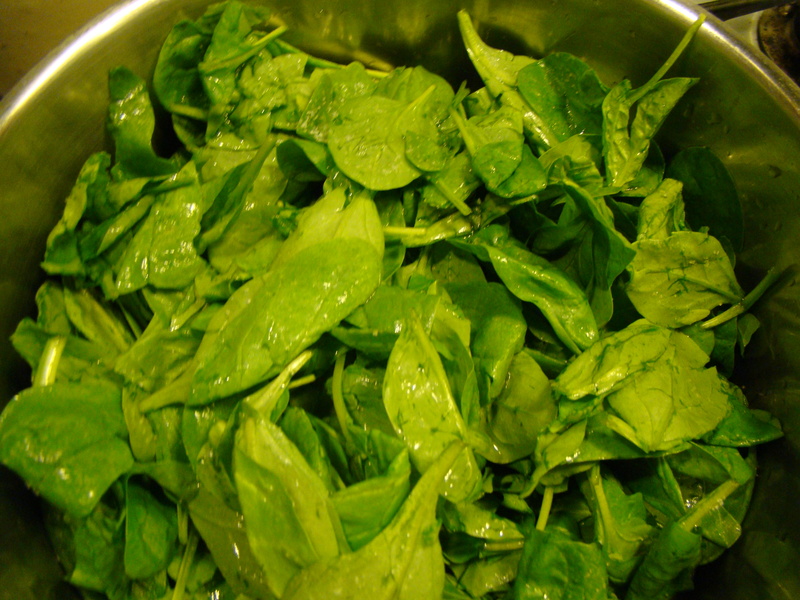 It IS amazing how much spinach cooks down…especially given how much space the fresh spinach takes up in the fridge! I agree that it doesn’t seem much like a “summer” dish, but it tastes good in the summer, so maybe it is. Betsy, hearty congrats on your 200th posting, give or take. We all marvel at your consistency and enthusiasm – organization be damned! Looks really yummy. I am a planner (go ahead & laugh) and Danny doesn’t eat spinach. Any suitable substitute you can imagine? PS – Congrats on post #200. I haven’t missed a single one. Very proud of you. Congrats on reaching 200 posts! Your not-risotto looks delicious! I was pleasantly surprised by this recipe, too. Congratulations on #200, that’s an achievement! Betsy, how funny you shared that quote by John Ruskin, and how right he was! Your rice looks beautiful and great pairing it with the grilled fish. You should be really proud to have written 200 posts….many, many congratulations! Congratulations on 200, Betsy! Your dish looks so creamy. I’m so glad you enjoyed this one. Have a wonderful weekend! Happy 200. And i always enjoy reading your posts. Nice work on the rice…looks beautiful. Great idea to serve as a side to grilled fish. I just love all the ideas I get by reading these cooking blogs…it has turned into a night time hobby for me. 200 posts, that’s terrific. Congratulations. Your rice dish looks wonderful. Nice that it was easy for a weeknight, which is why I’ve made it several times. We just had our with some fresh tomato bruschetta on the side. congrats on your 200th post! your rice looks terrific!! I was suprised by the liquid to rice ratio as well, but my rice turned out perfectly cooked. You wouldn’t think by tasting it that it all comes together pretty quickly and easily because it seems so fancy. Great post! I will add my congratulations on your 200th post! Lotta cooking and writing and photographing! I made the rice a second time with a different brand of rice…too much water (still was good but not as firm as the first time). Congratulations on 200 posts and two years! I just had made my 100th post and my first anniversary of blogging is coming up in a couple of weeks – looks like we’re posting at the same rate, but I’m a year behind! I was amazed at how easy this recipe was, too. I made the rice-packed peppers for dinner and loved how rich and filling it was. Your rice looks perfect. I was initially wary of this too because i wasn’t sure how the flavours would work together. It was marvellous, and glad you enjoyed it too. Congrats on post #200. I was skeptical about the liquid to rice ratio too, but I trusted in Dorie and it all worked out! Grilled fish sounds like the perfect accompaniment to this creamy, rich rice. Congrats on 200 posts! Yay for your 200th post! It must have been exciting to see that pop up when your post went up. Arborio rice takes a lot of liquid indeed! 200 Plateful’s of Happiness already?!!! C’est Magnifique!!! Bravo!!! Enjoying the recipes, the commentary, the twists from the Dora-ista’s. And of course that once in a while I get to actually partake in some of the fantastic results. Betsy, Congratulations on your 200th post! Such an achievement! Your rice looks delicious….glad you enjoyed it! Our weather is back to hot and muggy!